Smart Service locksmith scheduling softwares simplifies the process for your employees both in the office and in the field. As a QuickBooks add-on, Smart Service utilizes all the data you’ve already collected simply by running your day-to-day business. Our software gives you a complete view of who is in the field and their availabilities and our interface allows you to click any opening you see to schedule a new job. As soon as that job is confirmed, all job and client information is synced to your technicians via the Smart Service mobile app. Smart Service is the best software solution to optimize your existing data for easy scheduling! Because Smart Service is a QuickBooks add-on, we already have all the information to take the needless complications out of your scheduling. Our fully integrated locksmith software means human errors like double entering your data, misfiled transfers, and lost leads or customers comes down to zero. After installation, scheduling is simple. Just begin typing your customer’s name into a scheduling slot and any information on file is added to the new job for your technicians to see. New jobs are coming in all the time during the day. This means you have to be in constant contact with your technicians in the field about new or canceled jobs. 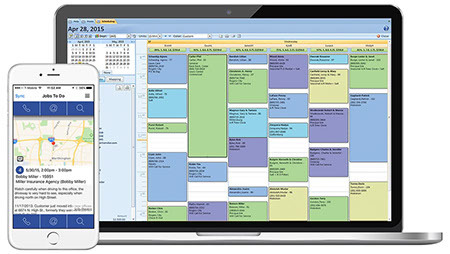 Smart Service scheduling software takes the back and forth phone calls out of your daily routine. Our locksmith software gives you the tools to tremendously improve your scheduling system. With our scheduling software solution, setting up a new job takes only a few simple clicks. And once that job is confirmed, the new information will automatically sync up with our mobile app so your technicians can have the information in real time. No more phone tag, no more double booking, and no more office chaos. Our Smart Service mobile app makes those manic calls to your field technicians a thing of the past. Once you’ve scheduled a new job in Smart Service and assigned it to an available worker, the app will send all the information to their phone or tablet. All the information you have access to in the office (new job details, work history, customer contact information, and notes) are displayed in the Smart Service app. In addition to keeping techs up to date, techs can keep you in the loop by letting you know where they are and sending back completed paperwork. This lets Smart Service generate a ready-to-bill invoice in Quickbooks and makes your process smoother. Rise above the locksmith competition with this business advice.